Facebook and LinkedIn Marketing: Comparing Apples to Apples. Social media remains a blind spot for many B2B marketers, despite the wealth of information available on the web and directly accessible on platform sites. Whether you find LinkedIn Help Center difficult to navigate or you only reference Facebook Help Center on an as needed basis, there are many resources available to help you succeed in social-media marketing. 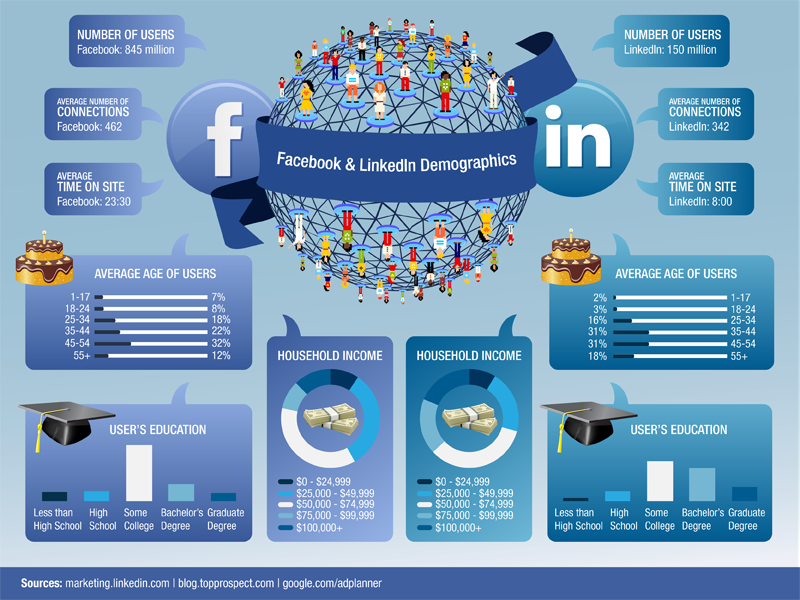 Marketing on LinkedIn and Facebook is a great way to extend your reach to a target audience. From ad bidding systems to cost-per-click models and measuring performance, B2B brands that leverage social platforms can optimize their marketing efforts. Below are my personal research notes -- a side by side comparison of LinkedIn ads versus Facebook for B2B marketers, and some tips for implementation. Spoiler alert: the two platforms are very similar. Audience Specificity: LinkedIn enables users to specify audiences by company, industry, company size, job title, job function and seniority level. Native advertising: Unlike ads, sponsored updates appear on the LinkedIn home page alongside ordinary company updates – making it difficult for users to dismiss. Real-time analytics: LinkedIn Analytics allows company admins to test the success of their message in the form of an unsponsored post and to make improvements prior to promoting it – for a lower cost-per-click (CPC). It’s also possible to adjust the settings of a current campaign at any time. Social sharing: Unlike ads, sponsored updates allow for free user engagement – comments, likes and shares – as an added boon to your CPC campaign. Audience Specificity: In addition to demographic and interest-based targeting, Facebook allows users to create a Custom Audience from uploaded contact lists and website and app activity – via tracking script. Retargeting: Not only do Facebook ads appear multiple times a day on the site but in using Custom Audiences from your website, you can remarket to users who have already visited your website. Real-time analytics: Facebook analytics allow you to determine which posts are performing the highest, and where the engaged users are coming from – using the External Referrers graph. It’s also possible to adjust the settings of a current campaign at any time. Comparable, right? The key here to follow your audience to their platform of choice. If they’re on Facebook – that’s where you’ll want to invest in ads. What if you want to split your budget across platforms? How do you know where to invest more dollars? Let’s say you split your budget evenly down the middle. You’ll soon notice which ads are performing better than others – which are the most economical, the biggest bang for your buck. For everyone interested in how their dollars are disbursed differently, here’s a breakdown of the different bidding systems. Note that Facebook bidding varies from LinkedIn and Twitter. Social actions, such as sharing or "liking" a post, are free. You pay whenever a user in your target audience clicks on your content, company name, or company logo. LinkedIn will suggest a Bid Range for first time users – it’s an estimated cost based off current competing bids by other advertisers. Each click will cost between $2.00 (the minimum cost per click) and your bid. Sponsored Updates prices are determined by a second price auction, which means you’ll only pay enough to beat the next highest bidder. For example, the winning advertiser has a bid of $5 cost per click, but the next highest bid is only $3. That means the winning advertiser only pays $3.01. In rare cases, it is possible that users continue to engage with a post in the interim after a maximum daily budget is reached and before the ad is paused. LinkedIn will charge a 20% overage for any clicks gained during that time. Facebook will disburse your maximum daily budget evenly throughout the day. Once the Daily or Lifetime Budget is reached – the ad will stop showing. Every Daily Budget resets at midnight. Although – if over time, your target audience tends to use Facebook in the morning, Facebook will adjust to maximize exposure. For example, if you bid $6 and the second place bidder bids $4. Then you’ll pay $3 for the top spot and they’ll pay $2 for the second slot. On both platforms you’re only charged after your audience responds. Again, if your audience isn’t present and active you won’t see much of an ROI. Again, these facts are available directly on each of the platforms’ help sites. At the end of the day, Facebook pricing tends to be lower than LinkedIn; however, both Facebook and LinkedIn generate optimal bidding ranges based off self-determined target audiences and fluctuating competitors. Therefore, the success of any ad campaign is predicated on trial and error. The key to successful social media marketing is continual maintenance and re-calibration. Use past posts as a means of A/B testing content. If one post has outperformed its peers – try recycling its image or verbiage in your sponsored content. Be conscious of various viewing platforms. Be it desktop versus mobile or newsfeed versus sidebar – customize your add for every presentation available during set-up. That may entail cutting down on characters and adjusting the crop of your image.